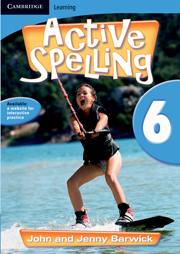 The Active Spelling series aims to develop confident spellers by addressing both 'automatic' spelling, and 'thinking' spelling. It will be useful in the classroom, but will not appear too self-important, or take away time from other KLAs. It will be attractive and easily accessible to children, while directly addressing syllabus requirements of all states. Active Spelling develops strong spelling skills. Its active and positive approach to thinking about spelling empowers students to take charge of their spelling capabilities. The series incorporates a variety of approaches to help students learn, addressing the range of learning styles in a typical class. The activities include opportunities to write, say and notice/see words, to think about words and the way they are spelt. The range of activities reinforces motor memory and oral learning, provides visual stimuli for the visual learner, and encourages a thinking approach to spelling. The dynamic visual element aims to attract and capture students' attention, enabling their engagement in active learning.